In the early 1990s, Stretch and Bobbito's legendary radio show set the stage for what's now referred to as hip-hop's Golden Age, introducing the world to unsigned artists such as Nas, Biggie, Wu-Tang, Mobb Deep and Big Pun as well as an unknown Jay-Z, Eminem, Cypress Hill, Fat Joe, and the Fugees. The total record sales for all the artists that premiered on their show exceed 300 million. Stretch and Bobbito created a platform that changed music forever. 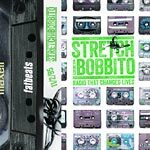 In an era before the internet, listeners recorded the weekly Stretch and Bobbito program on cassette, then dubbed them and shared copies with their friends around the world. Fat Beats Distribution was also responsible for the global spread of 89tec9 tapes, providing a platform for record stores and hip hop shops to sell them. Now Fat Beats is putting these tapes out again, starting with 3/2/95. Pop one in your walkman or boom box and relive a time in hip hop that can never be duplicated!